Using a wooden spoon or your hands, combine all the ingredients into a large mixing bowl. Make sure all the ingredients are blended well together (you can also mix it all up in a food processor). Cover the bowl and refrigerator the mixture for 1 hour. You can either use metal skewers or bamboo skewers; if you are using bamboo skewers, soak the skewers in water for 15-20 minutes before using them. Remove the mixture from fridge. Apply some oil/ water on your hands to prevent meat from sticking to them, and divide the mixture into equal portions. 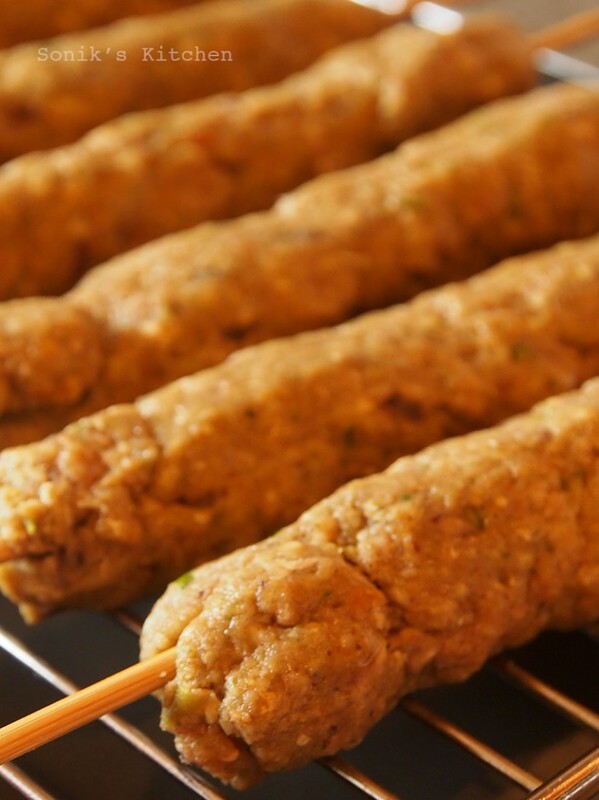 Take each portion and form it into a long sausage-like kebab, while pressing on to a skewer. Do this till the mix has firmly adhered to the skewer. Repeat till all the kebab mixture is used up. 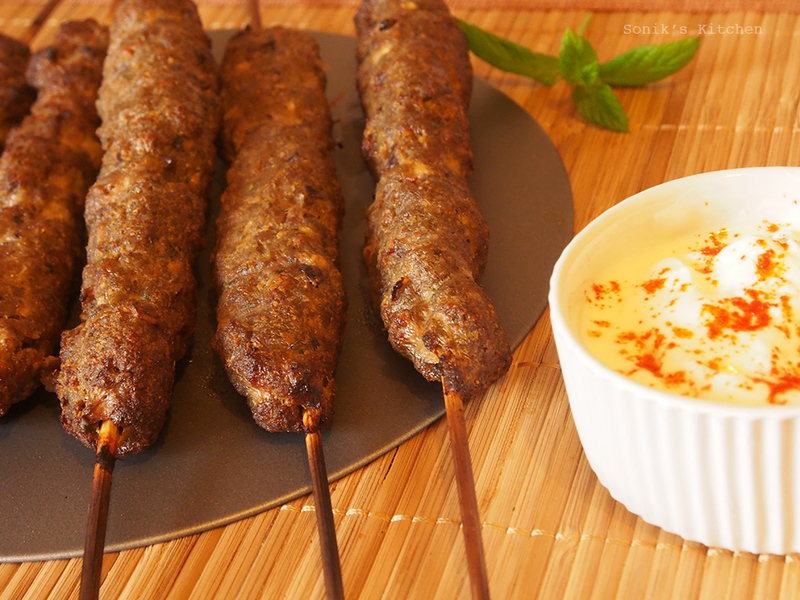 Preheat the oven to 200*C. Grill the kebabs for about 10minutes, and when the juices start to drip, remove the tray and turn over the kebabs carefully one at a time. Return to the oven and grill for another 7-8 minutes. You can also grill them on a pan with oil. Make sure not to over cook them so that the meat doesn’t get too dry. Remove from the pan and serve with lime wedges, spiced yogurt and salad. 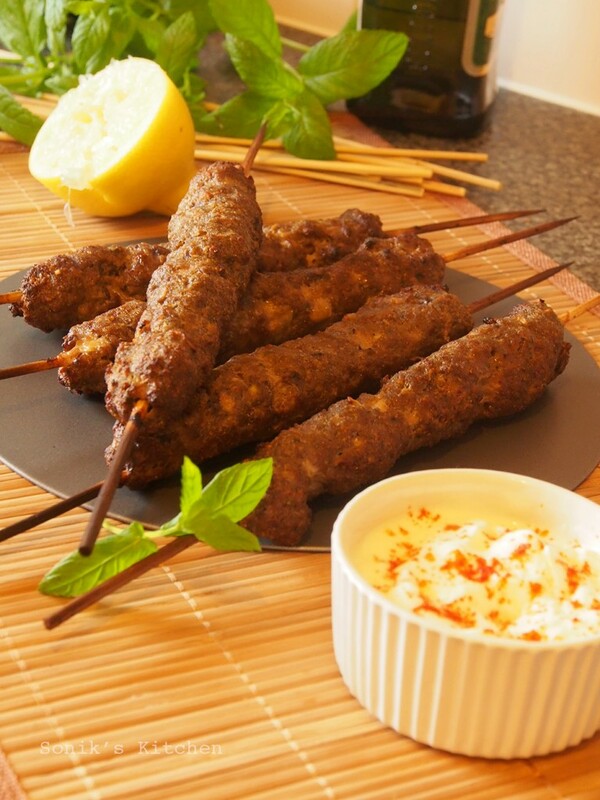 Note: You can use any kind of ground meat for this – beef, lamb or chicken. But it should not be too lean, or it will get too dry when you grill them.